I agree!, but just eat it, don't ask what it is. Before coke zero was the only light soft drink that tasted acceptable. Pepsi max is awful. But the raspberry could become my new favourite. Just had a "Spicy Italian" Subway, on parmesan oregano bread, toasted with all the vegatables and Caesar dressing. I got a knobber riding the Enterprise at the New York State Fair back in the ‘80s. Upstate Girls, best in the world! I grew up in Highland Park, a suburb of Philadelphia. The family that lived across the street was Italian and owned a deli/sandwich shop and a bakery at a strip mall within walking distance on State Road. It was normal as you walked in the door thee was the checkout counter then followed by the meat and goods display case and then a long bar with stools. The normal sandwich was a Hoagie (Philadelphia submarine) and they also had others such as homemade meatball and sausage. The bread was baked by the family in the bakery which was next door. Further down the strip was Jewish deli with the same inside configuration. All of the meat was cut to order on a slicer, my favorite being corned beef on rye. The rye was baked by the Italian bakery. Further down there was a small grocery that had almost any of the foreign delicacies that you wanted at at the end there was a drug store that made the best root beer float that I ever had. It was all right there. If you wanted anything else you hopped the bus to the 69th street terminal which was the end of the EL line and you could go anywhere in Philadelphia. Hanscoms automat was very popular where you put money in a machine with a turntable and got just about any food that y6ou wanted, all made fresh that day. That was 60 years ago and the fast food then was far better than what you can get today. Yes, but were the ingredients and caloric content listed? I've never seen either on any of the McDonald's crap that is available today and the last time I had a BMT, actually once a year when I got my income letter, which is now over, the pepperoni was cut about 1/4" thick and it was disgusting. The trick of cutting meat for sandwiches is to cut it as thin as possible. 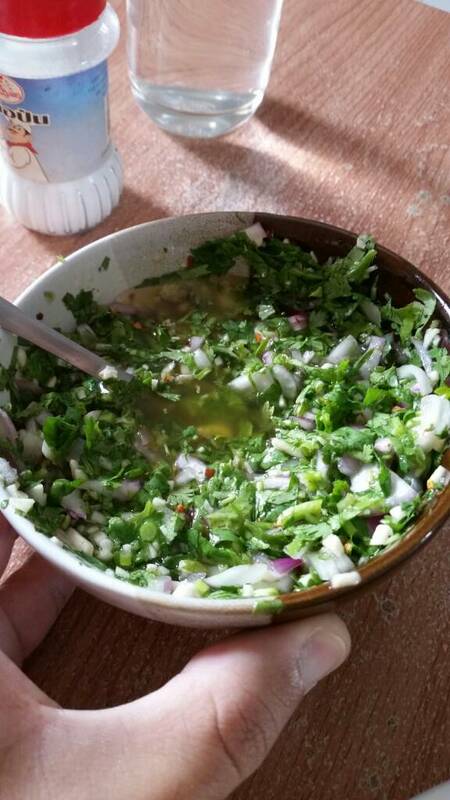 Kinda reminds me of how 7-11 cut the condiments when they had "fresh" burgers and hot dogs on buns. Pepperoni at most sandwich and pizza joints is pre-sliced. The last slice of meat I saw in Subway was that thin it only had one side. 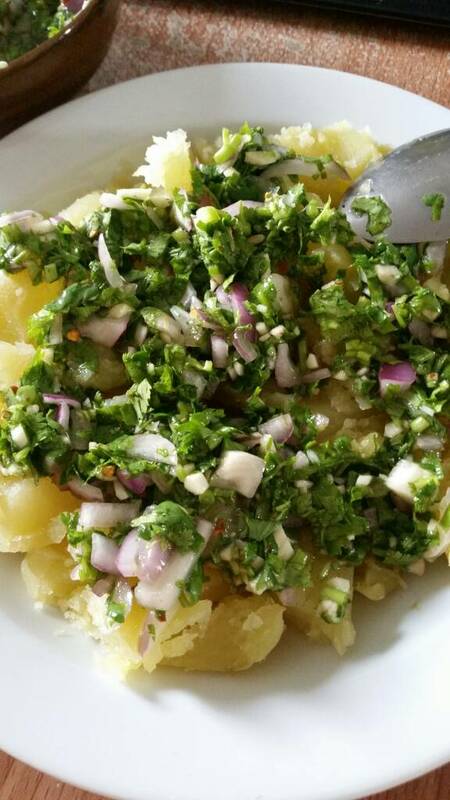 Boiled potatoes with homemade mojo verde. 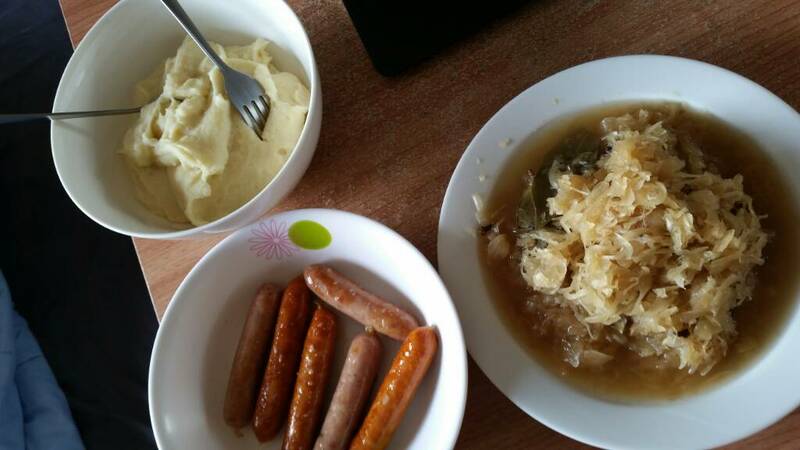 Sauerkraut, mashed potatoes and sausages. The sauerkraut and mash are imports from the last trip back home. Sausage are Thai ones from Big C in a vacuum pack, flavors chili paste and garlic. Many salivating recipes and pics on this thread. "Country style" boiled beef with vegetables. If my Mrs gave me that we would be talking divorce! Imported mashed potatos? I hope that you don't mean that "crap" that comes in a box.